The morning of day three of GöMUN 2018, the HRC saw significant progress in both of the draft resolutions proposed by the council’s delegates. Amendments were made to include the words “progress” as well as “quota”. Chair Olga praised the quality of both draft resolutions. However, they both failed and no resolution was passed regarding the topic of ensuring equal political participation for women. As a punishment for their late arrival that morning, the delegates of Ukraine and of Venezuela were ordered by the Chairs to give an impromptu presentation using PowerPoint slides showing mice, cars, and the pyramids of Giza, among other subjects. The two delegates, having never seen these slides, spontaneously decided to dedicate this presentation to the images of the first slide: rocks. They then went on to describe the advantages as well as the hazards of rocks, e.g. with regard to traffic or animals, in particular tortoises and rodents. These aspects, the delegates went on to explain, should also be integrated into early childhood education. Fellow delegates applauded their performance. In the afternoon, the committee moved on to its second topic for the GöMUN 2018: Addressing the Situation of Political Prisoners – Ensuring the Right to Fair Trials and Humanitarian Prison Conditions. Delegates of the HRC at GöMUN 2018 expressed their opinions as to how this issue should be approached, especially in view of the working paper to be written: what is the exact definition of “political prisoner”? How can political rights for prisoners be categorized? 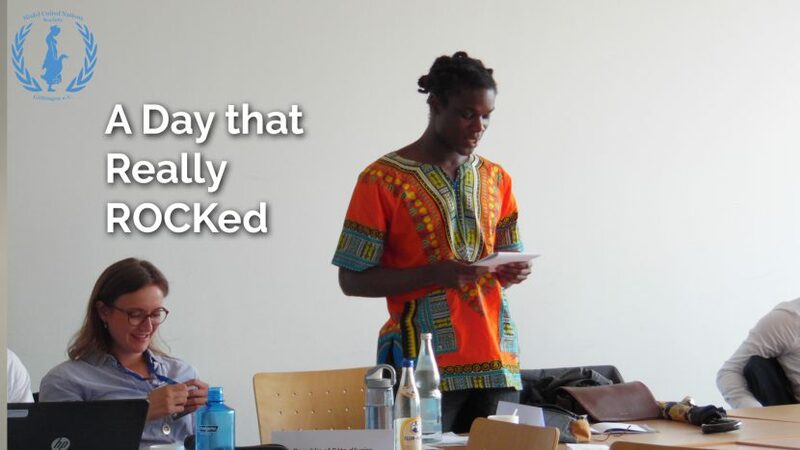 Also, another punishment was issued: The delegate of Togo had to perform a monolog from Georg Büchner’s Woyzeck, a play he is currently performing in in Göttingen. The entire council was thrilled by the delegate’s portrayal. All in all, day three of the HRC was a very diverse one: delegates moved on to the second topic, enjoyed 19th century German theater, and learned about protecting tortoises from rocks.